WHAT HAPPENED TO JONBENET RAMSEY? Interlocutor: You already know that I have scheduled a lot of questions to ask. Now that the "speech" was already given by Johnakan, I suppose that to you won’t think about something similar. Ruanel: I see that you have come in good mood. You can begin asking the questions. Interlocutor: Good, the first question that I want to ask you is related to the American child beauty pageant JonBenet Ramsey, in Boulder, Colorado. Ruanel: If you allow yourself to be guided by common sense, you will realize that most of the mysterious crimes are not made by terrestrials. Generally, most of the aliens make experiments with those beings that are useful to them by their DNA characteristics or because their organs can be used in their benefit. In some cases, those experiments go wrong and these aliens, totally unscrupulous, simply leave the body in the same place where they took it. Interlocutor: Master, I want to try to decipher what happened. Was the girl teleported to the ship? Did they practice vivisection with her and she was teleported back? Is it simply like that? Interlocutor: How far away was the extraterrestrial ship from the terrestrial surface? Ruanel: It was at about one hundred eighty kilometers. Interlocutor: What race of aliens are we talking about? Ruanel: Of the taller Grays. Interlocutor: Is this abduction part of the agreement that the Grays had with the authorities at Area 51 or they acted on their own without giving any importance to the agreement? Ruanel: There are some Grays, who act according to the pact they signed with the hierarchs of Area 51, but others act on their own and they don't give explanations on what they do. Interlocutor: Concretely, then, the taller Grays who abducted JonBenet Ramsey trespassed the pact? Ruanel: No, because they didn't make any pact. Ruanel: The extraterrestrials who agree to a pact surely keep it, because it wouldn’t make sense if they don't keep it since they have everything at their hands. What happens is that there are other taller Grays from the same origin, with another ship, but they don't have relationship neither with Area 51 or the Grays who made the pact with the United States. Interlocutor: Now I get the idea. It is as if the United States and Russia went to Mars, and while United States make a pact with the Martian Government and respects it, Russia could act on their own. Interlocutor: In the case of the girl JonBenet those who abducted her were the Grays of the same race, but independent? Interlocutor: What did they do to her in the ship? Ruanel: First they made a blood test, then a DNA analysis, and later on, through a biopsy, they extracted genital and brain tissues from her. They also removed part of her amygdala in her brain almost half cm3. To see how the impulse of her reactive mind was. Interlocutor: I don’t remember well. Is the amygdala the center of the reactive mind? Ruanel: Correct. The amygdale is the one that transmits the impulses, as well as the cerebral cortex is the root of the analytic mind, and starting from there, they made conclusions about human behavior. Interlocutor: Are these experiments only made with terrestrials? Ruanel: They directly study all the races of the Galaxy, not only the terrestrial race. Interlocutor: What intrigues me is why they take her back. I see that the same thing always happens, they use the bodies and then they throw them away somewhere. Ruanel: What happens is that they don't care about it at all. In order for you to understand how little they care, compare this behavior with the behavior of predator animals that catch their prey, they eat what they can and the rest they just leave it, so that other animals like jackals eat up the remains. Interlocutor: But then they are like animals! Ruanel: In their instincts, they are. But they have a tremendous knowledge, from the moment they can go through “worm holes” and travel enormous distances. Interlocutor: That is clear, Master, we know that the technical development not always accompanies the spiritual development. Did they return the body “packed” to simulate that it had been a terrestrial murder? Ruanel: Totally. And if there were good forensic doctors they would have realized that the body lacked of organs, as well as tissues in the brain and genital areas, and even of the pancreas. Interlocutor: I didn't read anything about an autopsy. Maybe the parents didn’t agree with it, I don't know. Well, I believe that this topic is over. Is it? Before the journalistic news saying that John Mark Karr admitted he was the author of the murder of JonBenet Ramsey, it is important to reiterate that the small girl was abducted by extraterrestrials like the Masters of Light said to us. It is necessary to keep in mind what the expert criminologists say in these cases: "in crimes that have overwhelmed so much to the public opinion, it’s common to find unbalanced people who will take responsibility of the crime in exchange of their fifteen minutes of glory." It seems that this is the attitude of John Mark Karr. And the proof that Karr didn't kill JonBenet it is that he affirms that it was an accident. This declaration is absolutely impossible because the girl was raped and strangled, and she also had a strong contusion in her head furthermore she lacked of organs. This categorically discards any kind of accidental death. In addition, the brother of John Mark Karr, Nathaniel, who lives in Atlanta, said that his brother lived in Alabama and California, but he never stepped a foot in Colorado (the girl was killed in Boulder, Colorado). 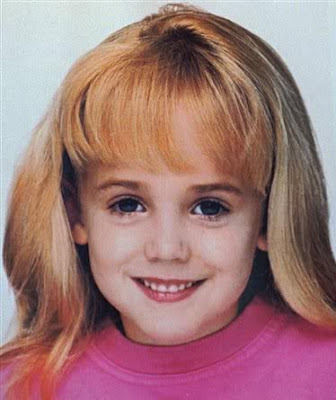 Besides, the district attorney of Boulder, Mary Lacy, said that there was no physical proof connecting John Karr with the murder of JonBenet Ramsey. Remains of DNA were found in her underwear and they don't belong to John Karr. Other indications of Karr don't fit with the facts: he declared he had picked up JonBenet at the school the day her death and that he had drugged her and raped her. However, on December 26, when the crime occurred, there were no class in the schools of USA; the forensic exam didn't find signs of drugs in the body of JonBenet, and the indications of sexual violence were not conclusive. On the other hand, the former wife of John Mark Karr, Lara, declared to a Californian television channel that John was in Alabama with her at the moment of the crime and she doesn’t believe her former husband has been involved in the crime. This entry was posted at Sunday, September 13, 2009 and is filed under Extraterrestrials . You can follow any responses to this entry through the .